This is a live-blog covering the first day of the 2013 Iran Presidential Election. We will provide coverage throughout the day. The newest information will be at the top, with older information further down the page progressing in reverse-chronological order. Refresh this page as the day progresses for our most recent coverage. Timestamps are in Tehran time. 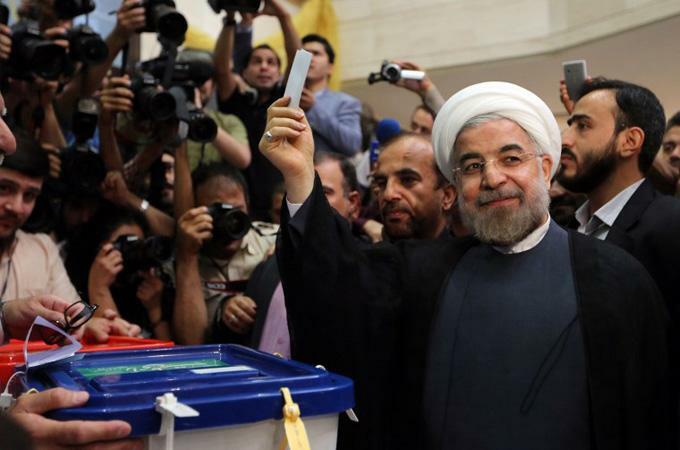 #Rouhani has won Iran's presidential election, securing over 50% of the vote and so avoiding the need for a run-off. Regardless of whether one is pro- or the Islamic Republic establishment anti-establishment, this is indeed an epic day, and on so many levels. INN will provide extensive post election coverage of the election and how we got here. I’m sure there will be a frenzy of pundits and analysts jumping into the fray to try to determine what it all means, and many will be extremely cynical. A healthy dose of cynicism was never a bad thing. But this is a victory for the Iranian people in several distinct, profound ways. The least of which is simply the fact that they exerted their will and did not sit idly. They made their voices heard and loudly. And they picked the candidate that promised change! They picked the candidate that promised to free political prisoners and pave the way for reconciliation between all Iranians, everywhere expatriates and those who live in Iran! They picked a candidate that promised to end the stifling security atmosphere in Iran. Will he deliver? Will he pull an Obama-style switcheroo and simply use all of the existing organs of the state that people despise to his liking, ignoring his promises? Who knows. Right now, Iranians deserve the space to take it all in and they also deserve respect. Iran News Now congratulates the Iranian people and President, Dr. Hassan Rouhani! Supreme leader trying to make people forget about 2009 and move on? IPOS posts latest count: 11.5 million votes counted, Rouhani at almost 52%. Now, now, let’s not get testy… Somebody just a little bit sensitive about perceptions? With more than 9.2 million votes counted — almost a quarter of the total — Hassan Rouhani has more than 5 million (54%). Mohammad-Baqer Qalibaf is failing to gain ground, with more than 1.58 million votes. Mohsen Rezaei has moved into third place, with almost 1.3 million votes, passing Saeed Jalili with less than 1.23 million. 10:00 With Iranian state media reporting that Rouhani has more than 50% of the vote, did he win the election? It would appear, tentatively, like the answer to this question is yes! I say “tentatively” because in the rough and tumble political soap box that is the Islamic Republic of Iran, one can’t take anything for granted, and anything can and sometimes does happen. State tv constantly showing pictures of candidates, Rowhani leading with over 3 million votes. When I started this live-blog I titled it Voting Day, Round One. Will it be a “Political Epic”? because (1) I thought there would probably be a run-off, believing it would be unlikely that anyone would get more than 50% of the vote, unless there was a massive turnout (making it harder to tamper with the vote and likely working in favor of Rouhani) and (2) because the supreme leader, Ayatollah Khamenei, had used the term “political epic” months before the election when we declared that Iran would hold an election that would become a political epic. It appears that indeed it has been an epic day in the politics of Iran! Barring some crazy surprise, Hassan Rouhani is effectively the next president of Iran! There is a mountain of information to sift through as we continue our live coverage, but it looks like there probably isn’t going to be a second round run-off. Still no news as to the outcome of the vote. But some tantalizing clues / tidbits from the various campaigns. This is at least moderately peculiar. So something seems to be brewing… We’ll continue to wait and watch. The regime’s Fars News has some clarification about the time that the election results will be announced. @arashtoronto No counting in small towns started at 10. other cities 11 or even sooner. According to the BBC Persian, the 1st round of election results will be announced at 02:00 local time – in approximately 30 minutes. Dave Siavashi adds that in 2009, the results were announced with people in the streets and passions running high. At this hour, everyone may be asleep. This is another visible example of how the elections have been engineered to resist sparking the protests that occurred in 2009. A new day. James Miller takes over from Dave Siavashi. EA Worldview points out that Saeed Jalili has been tweeting out the results of some of the smaller villages – of course, only the villages where he is ahead. EA’s editor, Scott Lucas, tells us that Jalili has posted one result where Rouhani is ahead. 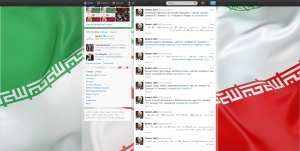 Jalili camp erases claim to majority of the vote in 21 provinces from his Facebook page. Security forces have long vowed that they will not tolerate renewed “sedition.” And for the first time, Khamenei explicitly recognized on Wednesday that not all Iranians back the Islamic system, but asked them to vote anyway. The voices from Iranian streets were a blend of duty among conservatives, joy among some at the possibility of reform-style change based on a last-minute surge by centrist candidate Hassan Rohani, and also deep skepticism from those who feel their vote has no value. The recent history of reformist candidates is marked by danger in Iran’s political space. Mir Hossein Mousavi and Mehdi Karroubi, both former senior government officials and reformist presidential candidates in 2009, were accused of sedition for leading the protests and remain under house arrest. The several million Iranians who protested in 2009 – when official turnout was declared to be 85 percent – believed Mousavi was the landslide winner after an unforeseen surge in the final 10 days of the Mousavi campaign. Instead, incumbent Mahmoud Ahmadinejad was declared the victor by a 2-to-1 margin. “Because [Rohani] is not known as a reformer, and he has not introduced himself as a reformer, there is a relatively high degree of tolerance from the conservative establishment towards him,” says the Tehran analyst. “[But] there is no great movement, there is no national wave as we had four years ago, and as we had when Rafsanjani said he would run” a month ago, before he was disqualified, says the analyst. The disqualification by the Guardian Council of Rafsanjani, a two-time president who ran the Iran-Iraq war in the 1980s and oversaw the reconstruction of the country, shocked many Iranians after raising widespread expectations from a man long deemed a pillar of Iran’s 1979 Islamic revolution. Among them was Keyvan, who chose not to join voters crowding mosques in west Tehran, but to instead play badminton with his girlfriend. “Let me be honest, when a politician like Hashemi Rafsanjani is disqualified and was not given the right to compete in the race, could you call it an election?” asked the 29-year-old. Thomas Erdbrink reports that Iran state TV saying all of the candidates have signed a statement calling for no gatherings until the official result. On first thought, this seems to fit with the supreme leader’s and authorities’ desire to avoid anything that might balloon into a protest. And to add to that thought, let’s make sure everyone understands that Iran state TV has never been a reliable source of information on just about anything. And as a final thought, it would not be out of the realm of the possible that the remaining candidates, all of who were vetted by the Guardian council for their loyalty to the system and the supreme leader, have either acquiesced to someone’s wishes on this matter, or are also of the view that, no matter what (including if there as been any tampering of ballots), they don’t want to see a repeat of protests like in 2009 either. State tv reports representatives of all 6 candidates signed a statement calling for no gatherings until official result. Mehdi Saharkhiz brings our attention to the Jalili campaign’s Facebook page, claiming that Jalili has signficant votes in 21 Iranian provinces. Fars reports that polls extended to 10:00pm now. This is the third extension. It seems the officials are going to extra lengths to avoid the perception that they closed the polls before polling stations are empty. This is probably an attempt to portray the system as having been careful to let all voices be heard, a move intended to quell any notion that the vote may be manipulated in any way (like in 2009). The voting period has been extended twice so far. First time to 8pm Tehran time. The latest extension is to 9pm Tehran time (25 minutes from now). The general director of Fars News, Abas Aslani, has tweeted that the election will likely result in run-off between Rouhani and Ghalibaf. (A run-off would only occur if no candidate achieved a clear majority of the vote). He has indicated as well that state TV is prepared to hold debates between the two remaining candidates in the event of a run-off. Ahmadinejad voted quietly, without any public messages. Mehr News is reporting that Ahmadinejad plans on voting at 5:00pm. Some images from Instagram on Iran Election 2013. Have not posted the originating accounts to protect the identities of the owners. A smiling man tells me that he hopes The New York Times building burns down in order for the paper "to stop publishing lies." Interior minister Najjar says that "this time votes will be counted "faster" – in 2009 it took only hours. Rowhani's campaign reports that the name of candidate Aref who has withdrawn is still on some ballot papers. Oops! Convenient “mistake”? A way to take votes away from Rouhani? Wonder how widespread this is. Rouhani campaign posts latest IPOS poll numbers, showing Rouhani in the lead with 38% of the vote and Ghalibaf at 24%. Polling in Iran has its problems. This survey was conducted as part of iPOS’ daily tracking polls of Iran’s presidential election on June 12-13, 2013. I just stepped out of supreme leader Khamenei’s office in downtown Tehran, where I saw him vote. Now driving through Tehran, its sunny and polling stations have just opened. At supreme leader Khamenei’s office journalist were body searched 3 times. I am at a polling station in Tehran’s Geysha neighborhood. Surprised to see lines of people waiting. Government agency IRNA quotes Iran interior minister Najjar as saying there are 60.000 polling stations. An over zealous police officer held me up at a polling station in Yousef Abad, less busy there. As I have no regular access to Twitter I apologize if I am not able to answer your questions. Like Mousavi 4 years ago, cleric and candidate Hassan Rowhani voted in city near Tehran, Rey. Friday morning in iran is the equivalent of the western Sunday morning, in south Tehran the morning is lazy. Conclusion after visiting several parts of Tehran: most I asked said they voted for Ghalibaf. Now heading up north on the newly opened Imam Ali highway, build by Ghalibaf, who bulldozed neighborhoods to build it. Unlike other zealous officials outgoing president Ahmadinejad has not voted yet, according to reports. Not too many saying they voted for nuclear negotiator Jalili. Many in Tehran say they fear his hard line stance. Don’t be fooled by simplistic explanations: Iran presidential vote can make a difference, for better or worse. 1207 Al Jazeera English reports that Rouhani has voted. I have come to destroy extremism and when I see that these extremists are worried by my repsense and my vote I am very happy. It means that with the help of the people we can instill the apporpriate Islamis behaviour in the country. Not sure that the message of “instill the appropriate Islamic behavior” is what people are voting for. Something to ponder: could Rouhani be the equivalent of the Iran’s Barack Obama, promising reforms and curbing of government excesses, freeing of political prisoners and so forth, only to pull a switcheroo if he wins? Of course that’s a big if. He would actually have to win first for Iranians and the world to find out. 11:56 Negar Mortazavi reports on campaign on Facebook to promote the vote: people changing their profiles to picture with green background with words, “I vote,” written on it. 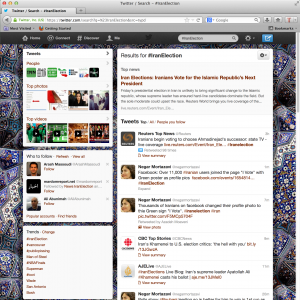 The hashtag #IranElection is trending on Twitter. This happened in 2009 and during many of the days of unrest that followed that year and afterwards. Conservative candidate and Iran’s nuclear negotiator, Saeed Jalili casts his vote in Ray (as per a tweet from his campaign). Reuters posts video of the supreme leader casting his ballot. To vote or not to vote for Hassan Rouhani, the sole reformist-backed candidate standing in the race, is the dilemma shared by hundreds of thousands of people who lost faith in the fairness of Iranian polls. For families who lost loved ones in the aftermath of the 2009 election, the buildup to the vote is adding salt to the wounds. At least 100 protesters are believed to have been killed in the protests. Unlike Neda, whose death resonated globally, prompting world leaders to comment and inspiring films and books, the identities of a large number of those who lost their lives remain unfamiliar to Iranians. Shirin Sadeghi posts another picture of Ayatollah Khamenei casting his ballot. #Iran: There are more than 130,000 polling booths in place for today’s #Iranelection. #Iran state TV is showing footage after footage of lines at polling booths across Iran. The message is clear, vote: everybody’s doing it. As anywhere, the patriotic fervor in the election press coverage is heavy. But in #Iran the music used on news shows is only men’s voices. The story of Iran, leading up to today’s election, is a long one, fraught with twists and turns that have led to a nation full of contradictions. Iran is a diverse nation, a fractal mosaic of cultures, ethnicities and faiths that, despite the contraditions, forms a unique gestalt. Let’s start from say … June 2009. In the lead-up to the June 12 elections in 2009, under the control and leadership of an old guard of revolutionaries, headed by a cleric whose privileged position let’s him sit above the fray of it all, Ayatollah Khamenei, Iran held a presidential election. The incumbent in that election was Mahmoud Ahmadinejad. You all know him. He’s the guy that that everyone loves to hate because of his bombastic statements about Israel, and his denial of the holocaust (among other reasons). Iran’s presidential election cycle is much shorter than in most countries, lasting a couple of weeks at most and following a vetting process in which an unelected body of clerics and “jurists” appointed by the supreme leader, Ayatollah Khamenei, and Iran’s parliament, respectively, weed through presidential hopefuls, disqualifying the vast majority and allowing only those whom they deem to be most loyal to the Islamic system and supreme leader, to run. In 2009, one of the candidates was a former prime minister, Mir Hossein Mousavi. Mousavi ran a very successful campaign based on a promise to reform the Iranian system. His supporters rallied under a banner of reform, using the color green as their marker. Mousavi was able to pack stadiums and streets full of fervent supporters. People on the ground in Iran reported a sense of euphoria. On election day, people flocked to the ballot boxes across Iran. The mood was one of profound optimism and excitement. But things started to go in a different, more foreboding direction a few short hours after the ballot. Within hours of the ballot closing, an announcement was made by Iran’s Interior Ministry. But had he? To this day it is not 100% clear who actually won. But what is beyond any doubt is that the election was tampered with. There were major irregularities being reported across the country. Mousavi was announced as having lost by a land slide in his own home town. The numbers reported were too “perfect”, too boldly in favor of the incumbent. Supporters of Mousavi were shocked. The initial protests were peaceful. Hundreds of thousands of people marched in silence in the streets of Tehran and elsewhere. Many of them clad in green, and many of them holding signs and placards with a simple question displayed on them. These peaceful protests were met with a violent response by various government and quasi-government forces, including Iran’s volunteer Basij forces, the Revolutionary Guards, and even Hezbollah mercenaries. On June 15, 2009, millions of people marched in Tehran alone, only to be met with a brutal, violent government crackdown. During the course of the next few weeks, and for six months, on multiple occasions and dates, there were protests and clashes between Iranians and the government’s forces. Tens of thousands of people were beaten in the streets. Many thousands were arrested. Hundreds were killed. There were rapes and murders of protesters in the prisons and elsewhere. The major protests culminated on December 27, 2009 during the holy day of Ashura. This was one of the most violent day of clashes between the government forces and protesters. This is not meant to be a full history of what happened between the 2009 election and today’s, but suffice it to say that by February 2011, Iran’s supreme leader (though not admitting it outright) put Mir Hossein Mousavi and his wife, Zahra Rahnavard, and Mehdi Karroubi (another leader of the greens) and his wife under strict house arrest. They have been held to this day. Going to try to keep it short because I want to actually start reporting on what’s happening today. Initially, two of Iran’s notorious politicans decided to run. Hashemi Rafsanjani a.k.a “kouseh” or “shark” threw his hat (turban?) into the ring and applied to run at the very last minute. For years viewed as a pragmatic conservative, Rafsanjani threw his lot in with the reformists and greens after the 2009 election rigging. This upset Ayatollah Khamenei, and he and Ahmadinejad have worked to try to marginalize him since. Ahmadinejad had a preferred candidate in the form of his advisor and long-time friend, Esfandiar Rahim Mashaei, who he wanted to see take his spot. Many speculated that Ahmadinejad was trying to keep himself politically significant by pulling a Putin/Medvedev style switcheroo. Mashaei, a mysterious fellow who espoused more Iranian nationalism and harkened to the days of Cyrus the Great as the example of a great Iran, was despised by the mullacracy because of his bold disregard for their views. The Guardian Council, a 12-member body consisting of six jurists and six theologians, has been tasked with vetting hopefuls for their qualifications and confirming the election results. After the council’s screening process, eight candidates remain which after the resignation of Gholam-Ali Haddad-Adel and Mohammad Reza Aref, they reduce down to six: Mohammad Bagher Ghalibaf, Mohammad Gharazi, Saeed Jalili, Mohsen Rezaee, Hassan Rouhani, and Ali Akbar Velayati. Velayati is out as well. Many in western media labeled Jalili as the front-runner, partly because publicity he was receiving as Iran’s stalwart nuclear negotiator, and partly because of Jalili’s own crafty strategy of letting himself be referred to as the supreme leader’s man even though the supreme leader hasn’t named a preference for any particular person running (mind you, he has dropped hints). But it looks right now, a few hours before the ballot, like this strategy has backfired for him. Polls are dubious in Iran’s tightly controlled system, but the ones that have been circulating don’t put Jalili in the lead. The dark horse for the race, and the only cleric running is Hassan Rouhani. Not known as a reformist, and even having been critical of the greens in 2009, he is a former nuclear negotiator from the time of Mohammad Khatami’s presidency, and in the past three weeks he has run a campaign that has managed to fire up the passions of what many had deemed to be an uninterested populace. In the last days of campaigning, relatively large and highly charged rallies have been held across various cities in Iran for Rouhani, and the word on the street is that he is gaining popularity fast. He received a huge surge following Aref’s stepping aside to make way for a single centrist/reformist candidate and the endorsements of Khatami and Rafsanjani. Ayatollah Khamenei has repeatedly asked for a big turnout, causing a dilemma for those who wish to boycott the election in order to not let him use a large turn out to legitimize his rule. But the surprise move to the left by Rouhani, and also the desire to not let the leader marginalize people by just handing a victory to the preferred hardliner of the day, has led many to say they will indeed vote. A “political epic” is what the leader has called for. One way or another, he is likely to get one. But what kind? I’ll end the introduction here, as I need to dive into what’s happening and start reporting on it! I will endeavor to intersperse the live reports with more of the background story as time permits throughout the day. Oh and make sure you follow my colleague, Josh Shahryar, as he also compiles reports on the fantastic S&F blog. Make it a Political Epic! That’s what Iran’s supreme leader, Ayatollah Khamenei, has decreed for the 2013 (1392 in Iran’s calendar) Iran pesidential election. We will provide live-coverage throughout the day. Stay tuned.